This hidden health crisis has been brought about by a combination of factors. The extent of Europe's air pollution problem was highlighted by research undertaken by Queen Mary University of London, which found that tiny particles of carbon, typically created by burning fossil fuels, has been found in placentas. The air quality in London is currently such that by the end of January the city had breached its 2018 pollution limit. And across Europe there are calls for more action to be taken. 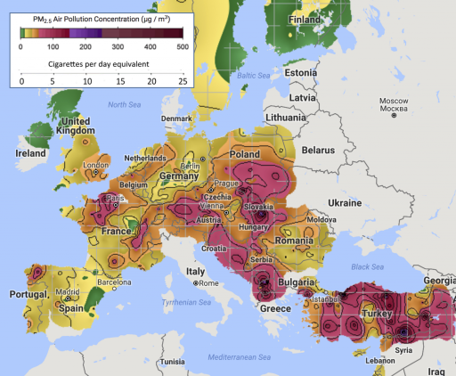 An analysis from Berkeley Earth concluded that in the most polluted parts of Europe, the air quality was as harmful as smoking seven cigarettes a day. Pascal Smet, the minister for Transport and Public Works in Brussels, took to Twitter to call for a car-free day in an attempt to draw attention to the issue and help with a solution. Taking cars off the roads of Europe’s polluted cities for a day would provide a symbolic gesture about the scale of the problem. But making sure that people can feel safe with every breath that they take will take a much greater effort.